– Discolored teeth, for example those stained from coffee, tetracycline or excessive fluoride among others. – Teeth that are worn down and appear as if they belong to an old person. – Teeth which are uneven, shaped irregularly, or are misaligned. – Teeth which are either broken or chipped. Placing porcelain veneers on your teeth is one thing and maintaining them is also another. As per Holistic Dentist, Dr. Vinograd, “Porcelain veneers are usually placed on top of the natural tooth, so you get to keep all your teeth during the installation process”. Only a small portion of the teeth’s outer layer is removed to make room for the veneer, otherwise your teeth will stay intact during the process of placing the veneer. 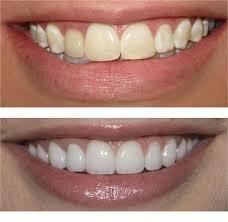 However, the biggest concern that most people have is about the maintenance of these veneers. Many people think that veneers are not as resistant as natural teeth, and that they can get stained by virtually anything. Studies have shown that porcelains veneers are actually more resilient than natural teeth. The veneers can resist coffee and tobacco stains up to ten times more than natural teeth. All you need to know about maintaining dental veneers is that they need to be treated like normal or natural teeth. Brushing and flossing are a must even for dental veneers. However, when brushing a veneer, it is often recommended that you use non abrasive toothpaste, so as not to harm or scratch the veneers. Veneers are fixed on the teeth with cement, so it might take you time to get used to them. However, once the veneers have dried, they will integrate into the natural teeth structure. In other words, after sometime, you will not even notice that they are there. A week after the placement of the veneers, it is recommended that you go back to your dentist. The dentist will then examine you and establish how your mouth is interacting with the veneers. Even if you have not had any problems with the dental veneers after installation, it is vital that you go back for this dental checkup, so as to secure the future of your veneers. Additionally, it is also recommended that you visit your dentist on a regular basis, so as to ensure that your veneers are well maintained and in good condition. Dr. Vinograd says, “Regular maintenance of veneers is a must and this should be done by a good dentist who will make sure that the veneers are well polished and cleaned”. Well maintained dental veneers can last for between ten to fifty years. It, therefore, goes without saying that the better you maintain your veneers, the longer they will last.